The Brest-based Comman­dant L’Herminier is the only ship in the Marine Nationale that can fly the pirate flag and, in fact, it is the only ship in France allowed to fly the skull and crossbones as the Jolly Roger is banned on pleasure boats unless you gain special permission. The 80m corvette (called un aviso) flies the flag to commemorate the original Captain Jean L’Herminier, a war hero who skippered the Casabianca submarine that escaped Toulon as German troops stormed the port in Novem­ber 1942. He had originally been a supporter of Marshall Pétain, and had helped defend Dakar against British attacks. As his submarine was diesel powered it was one of the few vessels that could raise power as the Nazis neared. He asked his crew if they wanted to scuttle the sub as ordered by the French Navy or try to reach Algiers, which Allied forces had recaptured earlier that same month. They voted to join the war. They reached Algiers and the sub was assigned to work with special forces being landed on Corsica to work with the maquis preparing for an invasion. It also took part in the invasion, landing more than 100 troops near Piana, north-west of Ajaccio, which was the first French city to be liberated. 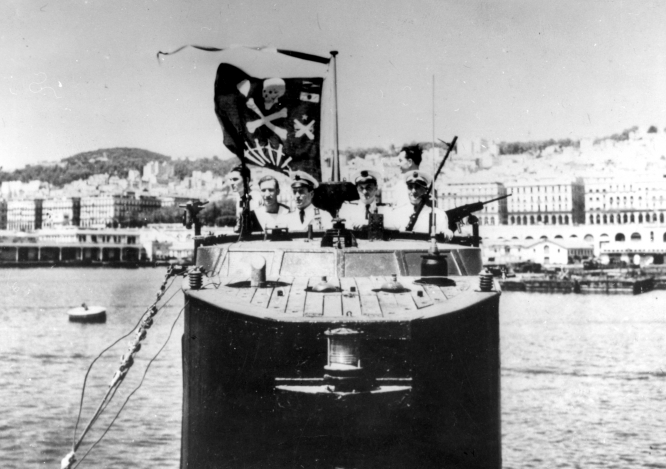 The Casabianca received the Jolly Roger in the Algerian port of Oran, where Captain George Fawkes, commander of the British 8th Submarine Flotilla based there, presented Captain L’Herminier with the pirate flag flown by subs after successful missions. Ironically, the present-day Commandant L’Herminier is an anti-submarine vessel. Skippered by Audrey Boutte­­ville, one of eight women commanding Marine Nationale ships, it maintains links with Corsica, where the Casabianca’s conning tower is on display in Bastia. The tower was presented after the sub was scrapped in 1956.